A poisonous vacancy becomes beautiful. Bourbon Country, that’s what they call it, but it’s almost impossible to find a bar. Eventually, I find one, with a giant TV screen blasting commercials at an obnoxious volume, and no customers. I fill up on the outskirts of Henderson. The gas pumps very slowly. “Do you have a kink in your hose?” asks the attendant. “Funny you should mention that,” I say, and continue up the slow, twisting river route. Every twenty minutes another anti-abortion billboard and another crumby little town with its tanning salon and video store. I assume that the emptiness of these places is a manifestation of my inner emptiness, but perhaps I’m merely an observer and there’s no psychic exchange going on. Perhaps the emptiness is already there, and will remain after I leave. Perhaps it’s not all about me, after all. How strange, after having operated on that premise for so long. 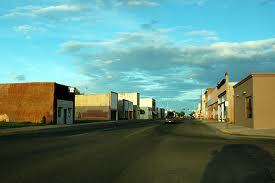 Owensboro is another seething, vacant town. I sit on the bluff and gaze down at the river. Smokestacks fume dreamily across the river but any potential tranquility is ruined by people motoring around loudly on some form of water skis. It’s a relief to find an open store advertising Racing Forms in the window. The little man behind the counter makes no effort to hide his immediately unfavorable impression of me. He notifies me that the Churchill Downs season is over, that Ellis Park is now running. I walk out, fed up with scared and suspicious small town people who pride themselves so much upon their non-existent hospitality. The agonizingly slow Dixie Highway delivers me into downtown Louisville. 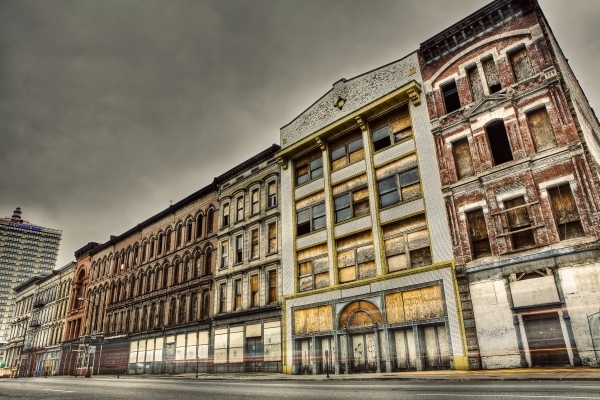 I take an evening stroll along the abandoned rows of storefronts on Third Street. For over three hours I drive around in search of accommodation. There don’t seem to be any cheap motels in Louisville and I’m not prepared to pay for a more expensive place, as I only need somewhere to lie down for a few hours, and it’s getting late. The cheap motels can be found out by the airport, so I’m told, so I drive to the airport, and find none. In a state of great agitation, I drive as far as Shively, Kentucky, where I find the Royal Inn, a frightening place, more project than motel. It consists of two floors with an enormous patch of overgrown turf in the middle. The woman at the desk appears to be dying of lung cancer. In the adjoining bar four fat Kentucky girls with frosted hair, wearing shorts, perform a karaoke version of a modern country song on a small stage. An old-timer gets up and sings “King of the Road.” I hover against a wall, drain my beer and return to my room. There’s not much incentive to get out of bed the next morning. It’s almost noon on a suffocatingly hot day by the time I finally rise to the occasion. I find my way to Churchill Downs. From there I’m directed to SportsSpectrum, apparently the largest off-track betting facility in the country. The California tracks won’t be running until 4pm eastern time. I buy a cup of coffee. Naturally, there’s no cream or even milk to put in it, just synthetic powdered muck. I park by the Seelbach Hotel and walk along a street of abandoned theaters and wig shops. Saturday afternoon, the downtown streets are deserted and I can’t find anywhere to eat until I stumble upon an Italian restaurant that serves only Middle Eastern food on weekends. A beshorted Caucasian homosexual brings me a vegetarian kebab that I’m too dispirited to eat. It takes half an hour to wade through half of it and push the plate aside. I drive around old Louisville with its streets of red-brick dwellings that I might have lingered upon were I in a more receptive mood. At 3.30pm I return to SportsSpectrum. I sit down at a table with a plastic container of overpriced watery beer and peruse the Hollywood Park card in the Racing Form. A young man in a purple T-shirt joins me. He’s excited, having already made $150. For the next few hours our fortunes vacillate, his more dramatically than mine. He leaves about $350 ahead. I make $23, and I’m delighted with it. The sun goes down and a full blue moon rises over the horizon. The reality of Lexington as a boring college town in summer doldrums comes as something of a shock. Once again my expectations erred on the overoptimistic side. I pull over in the campus area and eat in an otherwise empty Chinese restaurant. Luckily, I stumble upon the Kimball House, an unobtrusive red-brick building on a residential street: a boarding-house masquerading as a motel, presided over by a crotchety old widow who resembles Eudora Welty. She leads me through a maze of corridors to a small room containing a single bed, a chest of drawers, a rocking chair and a lamp with a huge dead cockroach lying in its upturned shade. The building is eerily quiet. I seem to be the only guest. Arrangements of decaying furniture stand in hallways and alcoves. The lobby contains some interesting features, including a vintage metal city-to-city mileage indicator on the wall. I venture out for a couple of drinks in a couple of frat bars, the only places I can find, and return to sit in the lobby, below the ceiling fan, on a battered, veiny sofa. The old lady is knocking on the door at check-out time, 11.00am the next morning, making certain that I leave on time. She fusses around the room, bemoaning certain liberties I have apparently taken with the air conditioner. Then begins the familiar futile quest for coffee on a Sunday morning in a southern town, ending in a styrofoam cup at Burger King. But what a change has come over the Seneca in the space of two years. It is now managed by an Indian couple, and they run it more like a penitentiary than a hotel. The lobby – once a paradise of senility, an anomic oasis of worn red leather – has fallen into a sad state of malignant decay. All but one of the old-fashioned pay phones and most of the arm chairs have been removed, and the smoking ban has spoiled lobby life: the tenants smoke alone in their rooms now. I take a room with a bath on the 6th floor for $35, a significant increase from two years earlier. The rooms used to be clean and timeless, with a bible on a worn dresser and crisp sheets. The first thing I notice this time around are the torn filthy curtains that don’t cover the window. A broken-legged bed slopes uncomfortably on to the floor, the sheets are bloodstained. Little piles of cigarette butts and other trash are swept into tidy little heaps in the corners of the room. Some graffiti on the wall reads ‘Buttfucka’. I venture into the bathroom: some roaches dart up the wall. There is no shower to speak of, only a large claw foot tub of ancient origin. It is very deep and I consider lying in it and reading ‘Mansfield Park’ until I notice that the surface of the tub is thick with undrained filth. I appreciate that I am not lodging at a 5-star hotel but I draw the line at cleaning a stranger’s scurf out of the bathtub. Nevertheless, I attempt to clean it out with toilet paper and water, these being the only materials available. The grime, however, is far too viscous to eliminate in this manner. The task proves too much. I ride the elevator down to the lobby and ask the Indian woman at the desk to give me another room. She gives me the key to a room with a bath on the 5th floor. The elevator is stalled. An old man in a suit and baseball cap (a charming combination that fortunately still remains the exclusive sartorial domain of the superannuated) stands patiently waiting. I give up and walk up to the 5th floor. I open the door to room 501. Trash is strewn throughout the room. It appears to already be occupied. I walk back down to the lobby and notify the bitter, crusty little Indian woman that the room is unacceptable, owing to its clearly still being occupied. She says that it isn’t occupied and that it will be ready in 15 minutes. I ask her if she could just have the bathtub in the room on the 6th floor cleaned out. She says that she will send somebody up. I go out to move my car to avoid street cleaning penalties, which takes over an hour. I have to park so far away that it is necessary to ride a bus back to the hotel. “What’s he shouting about?” asks her husband – he of the alveolate complexion – appearing behind the counter. “Oh, he’s just complaining about his bathtub. It’s not even dirty,” his wife lies. “The bathtub has six inches of filth in it,” I protest. The words trail away. I storm out of the lobby and attempt to enter Norby’s – home of the 50 cent draft and a potential balm to my soul – a few doors down, but the door is locked, the place is closed. This is almost too much to bear. I return to the Seneca. The elevator is still not working. I walk up to the 6th floor. The bath has been cleaned, but far from thoroughly: clusters of begrimed bleach remain. On the way back down to the lobby I notice that the janitor is ‘cleaning out’ a smaller room on the 2nd floor: the squalor is less spacious but it’s relatively clean. I ask the Indian woman if I can rent that room and forfeit the extra fee I had already paid for the bathroom on the 6th floor. She informs me that after this I will not be allowed to change rooms again. On each floor there’s a communal shower. In the 2nd floor shower the light switch doesn’t work. I turn the water on: it is tepid and there’s no surge. I check the shower on the 3rd floor: it’s the same, and additionally the lock is broken. I check the 4th floor shower: the lock is broken, the light doesn’t work, and the water is tepid, but there’s slightly more surge. I elect to take my shower, as best I can, on the 2nd floor, because the bathroom is situated directly next to my room and I can steal in with a towel wrapped around me and probably avoid encountering any fellow occupants while attired semi-nakedly. The towel can’t be tied around my waist, it isn’t long enough. I hold it around me as I enter the corridor. I turn the shower on: a thin jet of barely lukewarm water issues from a broken spigot. I get underneath it and it immediately turns off. I shake the shower-head and wail helplessly. I make it back to my room, violently shaking from cold and humiliation, put shirt and trousers on, and walk up to the 3rd floor bathroom. I am able to stand underneath the mean drizzle for about 20 unrefreshing seconds, as long as it takes to passably clean myself. Then I beat it back down to my room. In the lobby a 300 pound hairball of a woman slumps in front of the television, which is encased in a theft-restraint device of bulky plywood. At 11.30pm, he of the deeply-pitted visage emerges from behind the desk, walks across the lobby and turns the television off. One of the residents complains. The manager states that it has already been left on for half an hour longer than usual. I return to my room and lie on rather than in the bed – as these sheets are also bloodstained – reading Jane Austen and masturbating (not simultaneously). Throughout the night a mad growling issues from one of the many rooms bordering on the trash-strewn breezeway outside the window, and footsteps crash up and down the stairway directly behind the bed. At 8.30am, having slept little, I rise, forgoing the pleasure of a shower. I checked into the first motel I found. It was on Versailles road, the main artery leading into town from the airport. From the street it looked appealing. I should have heeded the warning in the night clerk’s shaky voice and viewed the room in advance. The eroded air-conditioner, burnt carpet, broken table, overpowering scent of poverty and death. This was familiar territory. Most disturbing was the absence of a bedside lamp. I had pictured myself relaxing in bed with a copy of the following day’s Racing Form. I walked back out to the car. Shadowy forms lingered outside their rooms and on the lawns. One of them, a barechested sexagenarian, groaned at me from a doorway. The motel appeared to chiefly function as a welfare-level apartment complex, with a couple of rooms set aside for the unsuspecting tourist. I got in the car and drove around aimlessly. Nothing beckoned. The few open bars were the exclusive domain of the college crowd. Upon my return a police car was exiting the motel driveway. Despite emerging from a spotless rental car I attempted to convey an impression of indigent swagger as I made my way, suitcase in hand, across the lawn, returning to the morbid reek. I turned the shower on. No warm water issued from it. I left it running and washed my face and hands in the sink. As I did so, the sink quickly clogged up. The shower continued running cold. I grabbed a towel. It looked as if somebody had wiped their arse with it. In a fury, clutching the shitstained towel, I walked across to the office and rang the bell. I rapped on the glass to no avail. TV drone was heard but the night clerk did not appear. It was one in the morning. I wasn’t tired. I toyed with the notion of checking into a different motel or sleeping in the car but found myself somehow sworn to a night in this sty, almost relishing the humiliation. Perhaps I should just slip into the bed with my Racing Form. I pulled back the cover. The sheet was a huge heart-shaped bloodstain. I charged out to the office again but still no response from the other side of the glass. It seemed unlikely that I would get any sleep. The following day would be ruined. I barricaded the door with the broken table and lay down on the bed. I opened the Form but lacked the heart to read it. I just lay there. Every once in a while I got up and peered through the blinds onto the courtyard. Nothing stirred. Eventually I must have dropped off and snatched a couple of hours sleep. At 7.30 on a spring morning I tried the shower again, letting the water run for about twenty minutes without its warming in the least. I stepped out into the spring morning and attempted to rouse the clerk. Again no response was forthcoming. In the daylight it was possible to observe that the lawn was covered with cigarette butts. That was my first night in Lexington, capital of horse country. I drove downtown. It was dull, grey and empty. A sabbath stillness prevailed. It took a lot of driving around before I found so much as a Starbucks. A line of locals in shorts streamed out of the door, deeply grateful for the luxury. I ordered a coffee and muffin.